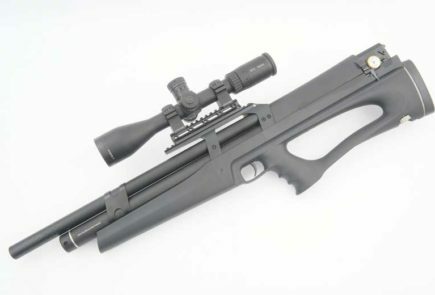 The Nova Vista HP-M1000 Multi Pump PCP Air Rifle. Airgun Pellet Penetration. Is Fastest Best for Hunting? Benjamin Marauder Air Rifle Test Review .22 Cal. How Many Shots Can I Get From A Replica BB Pistol? Very accurate with the right pellets. 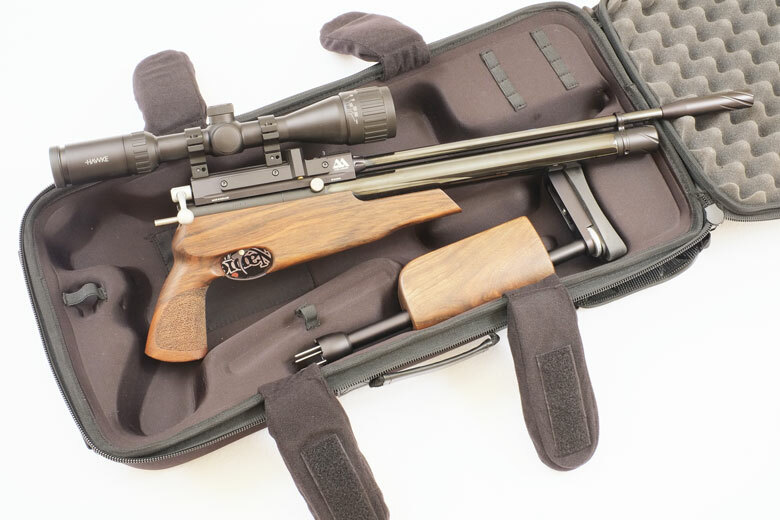 The Air Arms S410 TDR air rifle is a dedicated, takedown air rifle designed for hunting. It offers practicality and user-friendliness for the airgun hunter who will cover a lot of ground during his day's hunting. As you would expect, the quality and finish of the TDR are outstanding. 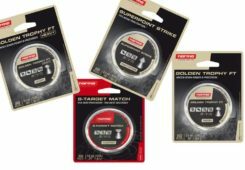 Accuracy is excellent with the heavy lead pellets that are preferred by serious hunters. The TDR gives the power you would expect from a full size PCP hunting air rifle, but offers it in a conveniently compact and light package. The only real downsides are the cost (at least for most of us! ), the lack of a silencer and the somewhat imperfect execution of the case. So, the TDR scores a solid HAM Silver Award, but just fails to make Gold this time. 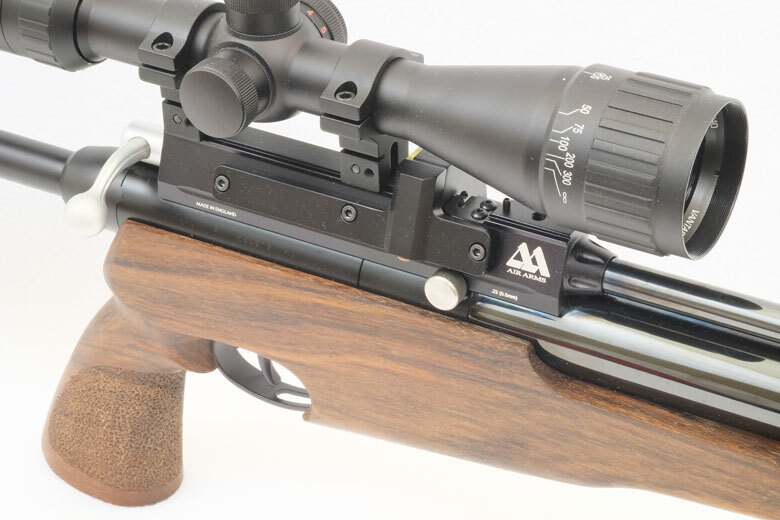 The Air Arms S410 TDR air rifle sells for $1,250, plus the necessary scope and rings. Clearly it’s not a cheap airgun, but it does offer a feature set that’s pretty much unique in the airgun world as a light, compact takedown PCP hunting air rifle. The only vaguely similar models are the PCP pistols from Hatsan and Crosman that can be fitted with a shoulder stock and “built up” into a carbine configuration. But these guns – like the Benjamin Woodswalker and Hatsan ATP2 – have much lower power levels and pricing than the Air Arms S410 TDR air rifle. 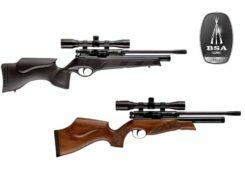 Yes, you could say that the numerous bullpup PCP air rifles are competitive with the TDR, but these are generally bulkier and heavier than the TDR, while many are equally expensive. 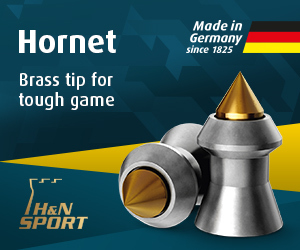 To the HAM team, these are not really competitive to the Air Arms S410 TDR air rifle either. 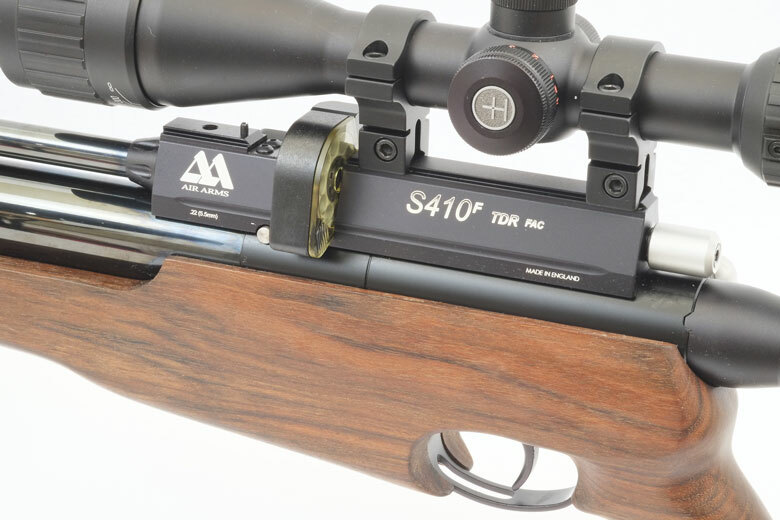 So, the Air Arms S410 TDR air rifle sits quite alone in what it offers. If you need what the TDR offers, it’s really the only game in town and you won’t be disappointed in its quality or value for money. 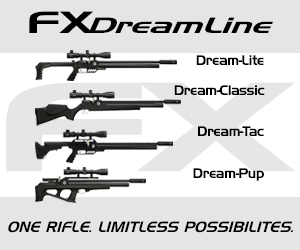 Value For Money If you need a powerful, takedown PCP hunting air rifle, this is it! The Air Arms S410 TDR air rifle tested by HAM gave a maximum muzzle velocity of 1,034 fps with alloy pellets. 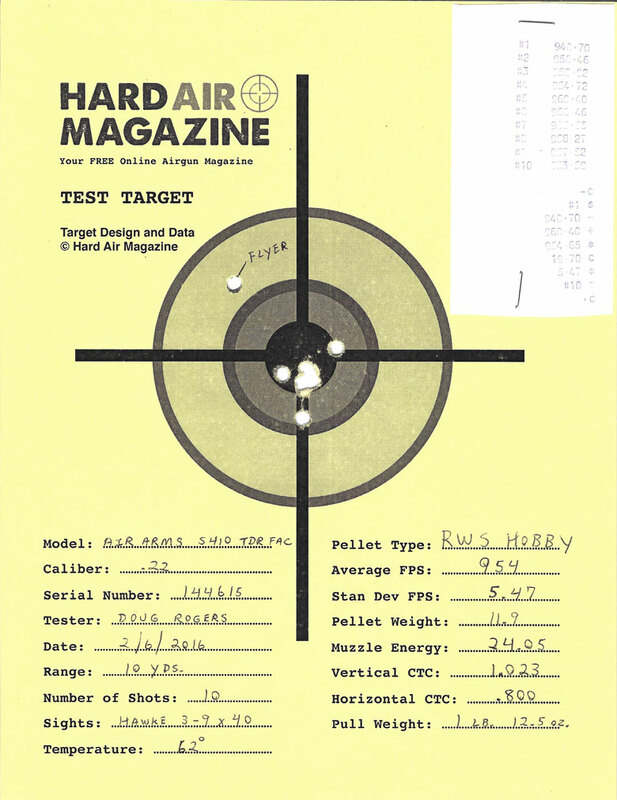 The best with lightweight lead RWS Hobby pellets was 954 fps. But most users of the TDR will be unconcerned with these numbers. They appreciate that the true requirement for hunting is the muzzle energy produced by an air rifle, not the maximum muzzle velocity. 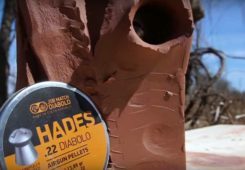 Most hunters will use domed lead pellets with a weight of 14 Grains or more. 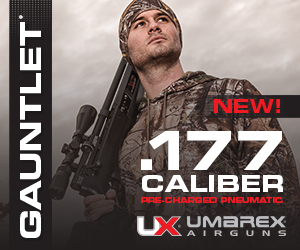 With pellets of this weight, the muzzle velocity is around 900 fps, giving a muzzle energy of 24 – 26 Ft/Lbs. This is an excellent power output from what is a small and compact air rifle. The Air Arms S410 TDR air rifle tested by HAM have its maximum muzzle energy with the heaviest pellets tested – as you would expect from a PCP air rifle. Accuracy of the Air Arms S410 TDR air rifle tested by HAM was excellent with all the “hunting weight” – that is 14 Grain and above – pellets in our standard test suite. Accuracy was very close to “one hole” groups with the Crosman Premier HP, JSB Jumbo Exact and H&N Baracuda Match pellets, as you can see from the test targets below. Gamo Raptor Platinum 9.7 Grain 1034 FPS 23.03 Ft/Lbs Poor. H&N Field Target Trophy Green 10.03 Grain 1022 FPS 23.26 Ft/Lbs Poor. RWS Hobby 11.9 Grain 954 FPS 24.05 Ft/Lbs OK.
Crosman Premier HP 14.3 Grain 905 FPS 24.20 Ft/Lbs Excellent. JSB Jumbo Exact 14.35 Grain 896 FPS 25.58 Ft/Lbs Excellent. Best Tested. H&N Field Target Trophy 14.66 Grain 898 FPS 26.25 Ft/Lbs Good. H&N Baracuda Match 21.14 Grain 757 FPS 26.9 Ft/Lbs Excellent. 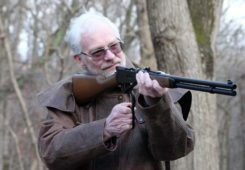 The level of power and accuracy displayed by the Air Arms S410 TDR air rifle tested by HAM was typical of our expectations for a high-powered hunting PCP air rifle in .22 caliber. But remember that this is a near-pistol-sized takedown model and these numbers become a lot more impressive! HAM tester Doug Rogers described the TDR’s trigger as “of course nice, typical of Air Arms quality” in his testing notes. As is our standard practice, the HAM testers did not adjust the trigger on the TDR, the pull weight and overall feel seemed ideal to us, just as it was set in the Hailsham, UK factory. 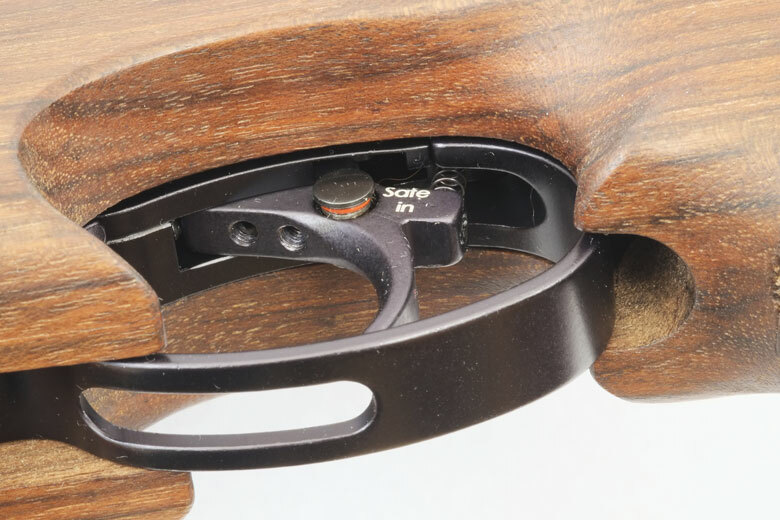 The Air Arms S410 TDR air rifle is fitted with a two-stage trigger. The first stage is rather short and light. The second stage is heavier, but very predictable and consistent. There’s almost no creep: once you have engaged the second stage of the TDR’s trigger, it’s very clear and you know just when it’s going to fire. There’s a typical Air Arms manual safety fitted actually in the trigger blade. Engaging this safety blocks operation of the trigger very effectively with just a short travel of the safety button. It’s ideal for right-handed shooters as the “push to make live” action is from the right (as you hold the gun), but this is less convenient for left-handers as HAM tester Doug Rogers will tell you! The TDR’s bolt action is surprisingly stout. It’s nothing like the buttery-smooth action of Air Arms sidelever actions, but is not objectionable in use. 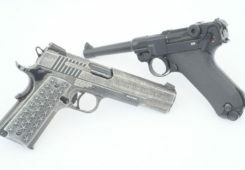 However the bolt handle does have to be pulled right back – beyond the click – otherwise the trigger will not be set, even though a pellet has been loaded into the barrel. This means that it’s possible to double-feed the gun if you’re not concentrating on bolt operation. Pull the bolt right back in one continuous, positive motion – as the User’s Handbook advises – and you’ll find there’s no problem. The maximum muzzle velocity claimed for the Air Arms S410 TDR air rifle is 900 fps in .22 caliber. This was easily exceeded buy the TDR tested by HAM, even with pellets as heavy as 14.3 Grains. 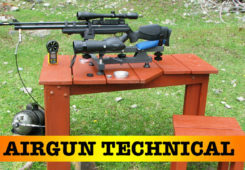 Air Arms claims that the TDR can be assembled in less than 20 seconds. We agree. The other claim made for the Air Arms S410 TDR air rifle is that it can be taken down and reassembled many times without the scope loosing zero. Again, we agree. 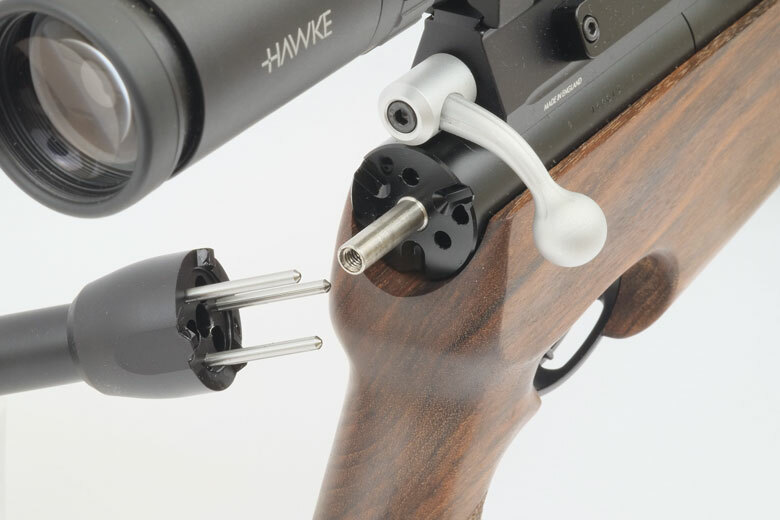 As the scope is firmly attached to the breech/barrel assembly and only the rear part of the stock removed, scope adjustment is not compromised by the takedown process. The photo below shows the rear buttstock removed from the action of the Air Arms S410 TDR air rifle. 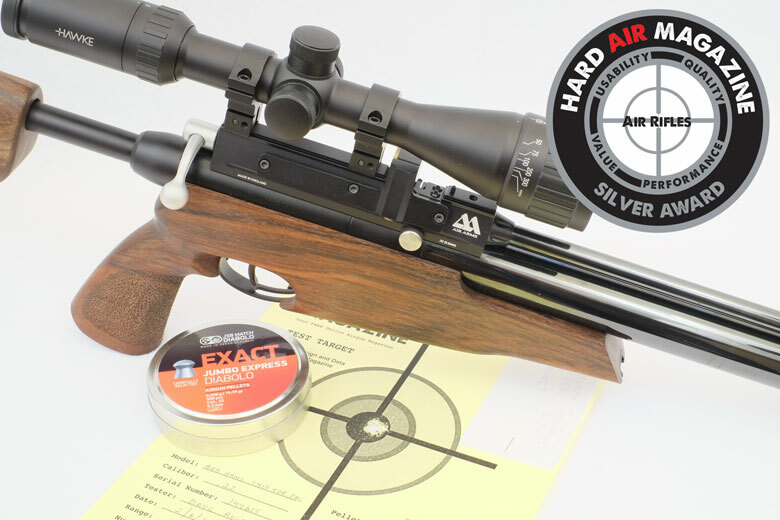 The Air Arms S410 TDR air rifle tested by HAM displayed outstanding consistency in a number of areas. The trigger pull weight was almost exactly constant at 1 Lb 12 Oz, straight out of the box. The most variation HAM tester Doug Rogers could find was only 2 ounces. That’s practically nothing! Trigger pull weight felt – and measured – almost perfect consistency. As already discussed, accuracy was also consistently good with lead pellets of 14 Grains and above weight. The Air Arms S410 TDR air rifle is not fitted with a silencer or shroud for the US market. 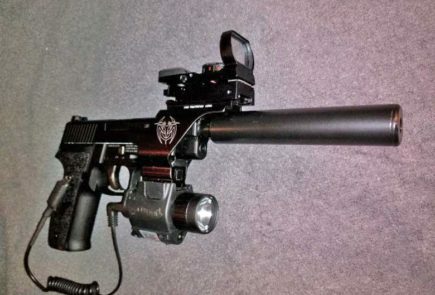 This, in combination with a relatively short barrel, means that the gun is not the quietest. Subjectively, we’d say that the noise level is about what we expected. It seems significantly less noisy than a Benjamin Discovery – for example – but obviously waaaaay louder than our benchmark for silent shooting, the Benjamin Marauder. As a dedicated hunting air rifle, this noise level may not be an issue for many shooters, however. The Air Arms S410 TDR air rifle is not supplied with a scope. The choice of optics is left to the purchaser and this is a sensible decision. 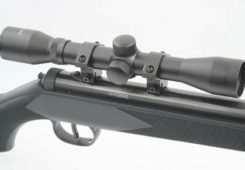 The Air Arms S410 TDR air rifle tested by HAM was fitted with a Hawke Vantage IR 3-9x40AO scope and two-piece rings. This Hawke scope is not too big and balances nicely on the TDR – in our opinion. The Hawke Vantage scope focuses down to 10 yards with a front AO (Adjustable Objective) system. This works well, as does the standard mil-dot reticle and the positive, click-adjustable elevation and windage turrets. The HAM testers found the side control for the red/green illuminated reticle to be somewhat stiff, but otherwise, this is a great scope which compliments the TDR very well. One thing to note is that the scope dovetails of the TDR are rather short – just 3.75-inches long, so some care is necessary when mounting the scope to achieve the correct eye relief for the shooter. However this was not an issue for the HAM team. No iron sights are fitted to the Air Arms S410 TDR air rifle, as expected. The Air Arms S410 TDR air rifle is small, light and easy to shoot. Its compact form factor and easy take down capability mean that this is an ideal air rifle to take with you when hunting. 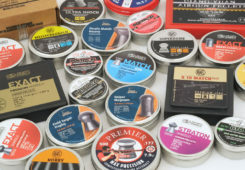 Air Arms provides a special case for the TDR and this – in principal – should also be a great benefit. It’s fitted with convenient shoulder straps that make it ideal for carrying the Air Arms S410 TDR air rifle on your back without the need to carry the gun by hand across challenging terrain. But that potentially-wonderful case is also, unfortunately – the main source of weakness with the TDR, as we see it. You see, the TDR will not fit into that beautiful case unless the muzzle end is first removed from the barrel. What a shame! This means that every time you take the gun out to shoot you need to either install the muzzle end or – D@*n It! – just leave the thing off, or not use the case. The other potential issue is that – in some mounting positions of the scope – it’s also not possible to fit the TDR into the case with the scope set for every ideal eye relief. It will work for some, but not others. OK, you can very well say that these are not disadvantages of the Air Arms S410 TDR air rifle per se. However, the case is bundled with the gun and is an overall part of the TDR shooting system. It’s a shame that Air Arms got so close here to the perfect backpacking, take down air rifle shooting system, for the case to figure as an issue with practicality. Note that, although the Air Arms S410 TDR air rifle can be fired without the rear stock attached, it will only fire at an extremely low muzzle velocity. So low, in fact, that the pellet may not exit the barrel. So, the rule is, only fire the TDR with the stock attached! As always, Air Arms quality of metal finish and bluing is absolutely second to none. The mirror finish and depth of bluing on the air tube and barrel is like a shiny black mirror. You couldn’t ask for better. The breech is in a dull black anodized finish that blends well with the overall look of the Air Arms S410 TDR air rifle. The wood stock parts also are very nice. Undoubtedly made by Italian stock makers Minelli, the two=piece stock is pleasingly-shaped and comfortable to use. Stephen Archer particularly liked the stippled finish to the pistol grip. This felt wonderful to the touch, guided the hand to the correct position, provided excellent grip and just looked great. The Air Arms S410 TDR air rifle is not widely available in brick and mortar retail stores. 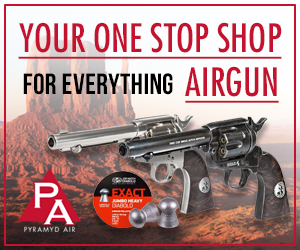 However, it is easily found on the Internet, primarily from Pyramyd Airguns, so this is not a big issue for most people. 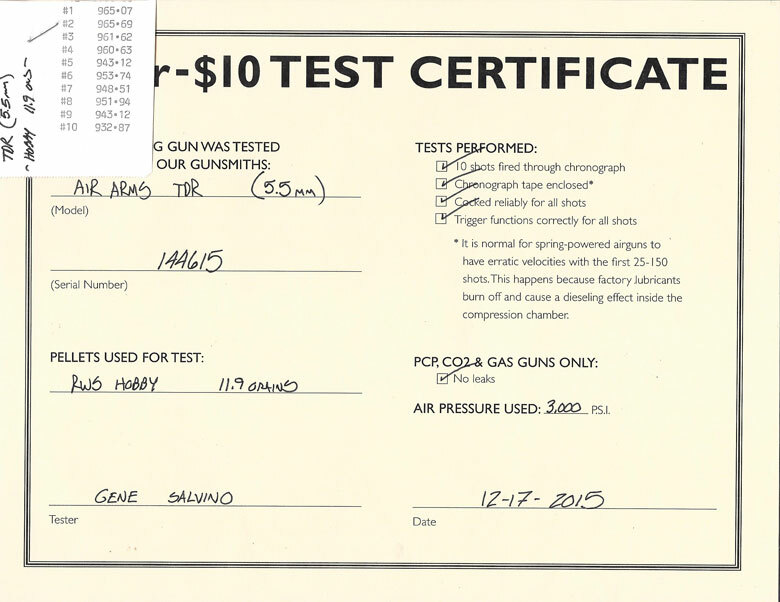 The Air Arms S410 TDR air rifle tested by HAM was supplied with a “10 for $10” test certificate from Pyramyd Air. As you can see, the measured muzzle velocity was very similar to the numbers we achieved on test. The certificate – signed by Pyramyd Senior Tech. Gene Salvino – gives a good feeling to the buyer that his TDR has been checked and was shooting well before shipment. As you can see, the Pyramyd test gives a very similar muzzle velocity to our HAM testing for RWS Hobby pellets. 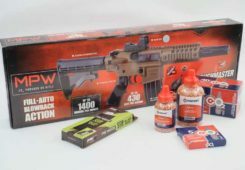 Guns sold in the US benefit from a limited lifetime warranty from Air Venturi, although – in the unlikely event that a gun needs attention – the customer is responsible for shipping costs to Air Venturi. 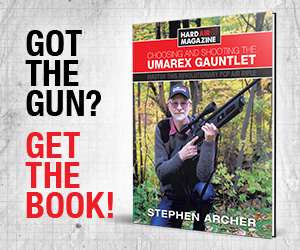 The owner’s manual (English language only) is comprehensive and covers the basics of filling and adjusting the Air Arms HFT 500 Air Rifle. Filling is achieved using the brass connector supplied with the gun. This screws directly into a standard female 1/8-inch NPT thread. Overall, it’s not clear to the HAM team why this is superior to the more common straight male/female quick disconnect connection. And note that the maximum fill pressure for the Air Arms S410 TDR air rifle is 2,900 psi – not the more common 3,000 psi. This entire article including scoring, test targets etc is Copyright Hard Air Magazine and may NOT in part or in whole be reproduced in any electronic or printed medium without prior permission from the publisher. Benjamin Fortitude Generation 2 First Sighting! Warning – Distressing Content! PCP Airgun Corrosion – This Is What Moisture Does To Your Air Rifle. Copyright © Hard Air Magazine. All right reserved. 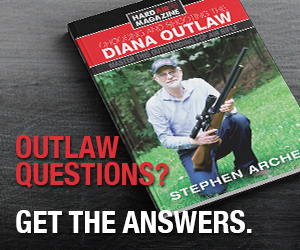 Hard Air Magazine is a Trademark of Archer Airguns Inc.